On Tuesday June 23rd. 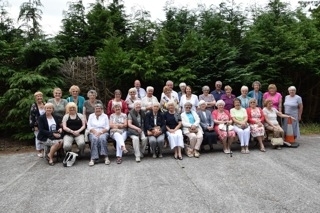 the MU left Dafen Church at 9.30 on their annual excursion. The Dafen ladies, were joined by some members of the Felinfoel MU and 2 gentlemen from the Dafen Men’s Fellowship. Our first stop was at the Woollen Mill museum at Drefach, Felindre where we enjoyed tea /coffee and a walk around the museum. We then continued our journey to the ‘La Calabria” restaurant Ffostrassol. The food and company were both top class. The main event of the day was our visit after lunch to the Italian Prisoner of War Camp at Pont Henllan. Here we were given the history of the camp (2nd. World War) by historian Jon Meirion Jones and the owner of the site Mr. Thompson. We were shown into the chapel set up by the prisoners themselves and painted by a young prisoner called Mario Ferlito, using very basic equipment and colours produced from plants. The visit was exceptional, all felt privileged to be there and to listen to the story so ably and interestingly told by Mr J M Jones.